Handyman Manchester is a family run buisness and all our handyman are fully qualified and time served tradesman. We take pride in our work! All our company vehicles are fully sign written so your mind is put at ease as soon as we arrive as we dont work out of car boots! 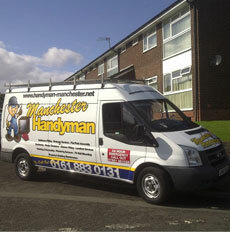 Handyman in Manchester covers the whole of the Greater Manchester area. We have worked as far north as Bury and Bolton down to Stockport and below. We pride ourselves on being prompt and reliable and making sure all of our customers are 100% satisfied with the work we do for them. Handyman Manchester is experienced in most trades and is confident you will be pleased with the result. If you job is too big or requires the attention of a Gas Safe approved plumber or NICEIC electrician we will let you know as we won’t do any work we are not qualified to do. As most of our work comes from repeat custom, word of mouth and referrals this means we don’t have to spend much money putting adverts in newspapers and local magazines. As we don’t incur these costs this means we can pass the savings onto the customer meaning you not only get a great service and end result but also it doesn’t cost you that much really. All we ask is that if you are happy with our handyman service and expertise then you recommend us to a friend, this way it keeps our advertising cost down, as well as our prices. Your handyman will be happy to quote on any jobs you want doing and will be happy to provide this as fixed-fee, anywhere across the whole of Greater Manchester. This means it is not an estimate or a guess at the price which will then grow from all the add-ons and extras. What it means is the price you see before we start the work is the price you pay when we finish the work. This way you won’t be hit with any nasty extras or unforseen add-ons. Whatever jobs you’ve been meaning to get round, but haven’t completed yet then our Manchester Handyman is there to help. We’ll get all the unfinshed jobs finished for you at a price you can afford and a service you can’t beat. We have repaired, filled and painted both internal and external window frames as well as replacing panes of glass and double glazed units. Installed skirting boards, laminate flooring, door frames and doors, added door handles and locks and then undercoated and glossed them. We have worked out side clearing and tidying gardens and yards before cutting the lawn, trimming hedges and bushes and power washing driveways and paths, we have also creosoted fences and painted outdoor doors and woodwork such as shed and garages. Inside houses we have replaced kitchen worktops, cupboards, refitted whole kitchens, added new cupboards or just replaced doors. Our Handyman Manchester team has also fitted lino, tiled floors and walls, fitted new taps and put up cooker hoods. Although we are not professional painters and decorators we are able to strip wallpaper, sand down and prepare woodwork and then emulsion walls and gloss the woodwork. Some people like this option as it mostly works out cheaper than employing a professional decorator with very similar results. If you are looking for complex finishes or complex wallpaper putting up then Manchester Handyman would be happy to recommend someone. In bathrooms in Manchester we have taken out old bath suites, tiled bathrooms, put up towel rails, mirrors and mirrors. We have also put up and installed self assembly bathroom and bedroom furniture such as cupboards, wardrobes, desks, drawers, bunk beds, TV stands and installed a few plasma and lcd TVs onto brackets on walls and chimneys. Our Manchester based handyman services also stretch much wider and cover a lot more home repairs and work. If you have some repair jobs in mind but are not sure if it is something we do then pick up the phone and we will let you know.